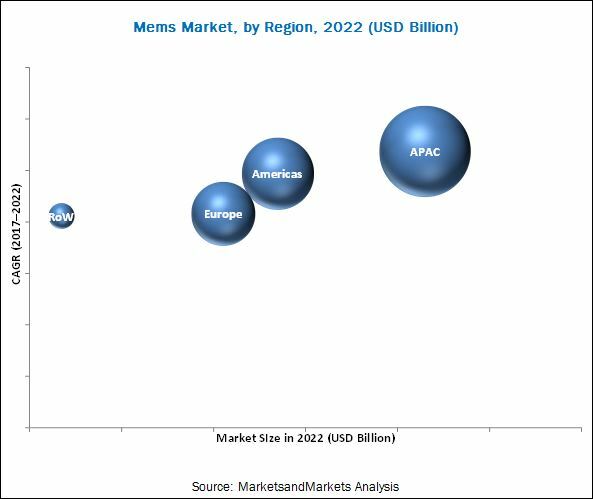 [172 Pages Report] The MEMS market is expected to be valued at USD 18.88 Billion by 2022, at a CAGR of 9.8% between 2017 and 2022. This report provides a detailed analysis of the MEMS market based on sensor type, actuator type, vertical, and geography. The growing demand for smart consumer electronics and wearable devices and the introduction of efficient, economical, and compact MEMS technology are driving the growth of this market. This report provides valuable insights on the ecosystem of the MEMS market such as raw material suppliers, MEMS manufacturers, system integrators and end users. The ecosystem of the MEMS market consists of raw material suppliers for MEMS device manufacturers. The main die manufacturers include IBM Corp. (US), Elmos Semiconductor AG (Germany), TSMC, Ltd. (Taiwan), ams AG (Austria), Goertek, Inc. (China), and ON Semiconductor Corp. (US). Some of the major OEMs of the MEMS market are Analog Devices Inc. (US), Honeywell International, Inc. (US), Robert Bosch GmbH (Germany), STMicroelectronics N.V. (Switzerland), and Colibrys Ltd. (Switzerland). The system integrators include Texas Instruments, Inc. (US), Denso Corp. (Japan), Delphi Automotive PLC (UK), Aisin Seiki Co., Ltd. (Japan), Standard Motor Products, Inc. (US), HP, Inc. (US), Canon, Inc. (Japan), and Harman International Industries, Inc. (US). The end users of the MEMS market include Samsung Electronics Co., Ltd. (South Korea), Apple Inc. (US), Honda Motor Co., Ltd (Japan), General Motors (US), and Ford Motor Co. (US). Company Profiles: Detailed analysis of the major companies present in the MEMS market. Among all the major verticals in the Micro-Electro-Mechanical Systems (MEMS) Market, the consumer electronics vertical held the largest share in 2017. The main driver for the growth of this vertical is the increasing usage of MEMS in electronics such as wearable devices; smartphones, tablets, and laptops; portable navigation devices; portable media players; digital cameras; and gaming consoles; as well as e-readers. The MEMS market for healthcare is expected to grow at the highest CAGR during the forecast period because of the high adoption of MEMS for clinical monitoring applications, imaging applications, diagnostic and treatment equipment positioning applications, and prostheses and patient monitoring applications. The inertial sensor type is expected to hold the major share of the MEMS market during the forecast period. This growth is attributed to the increasing usage of inertial sensors, such as accelerometer, gyroscope, magnetometer, and inertial combo sensor, in automotive applications such as electronic stability control (ESC), traction control system (TCS), and anti-lock braking system (ABS). Moreover, this growth is attributed to the high adoption in consumer and wearable applications for location-based services, gaming, built-in compass app providing screen orientation and for undoing actions by shaking the device. 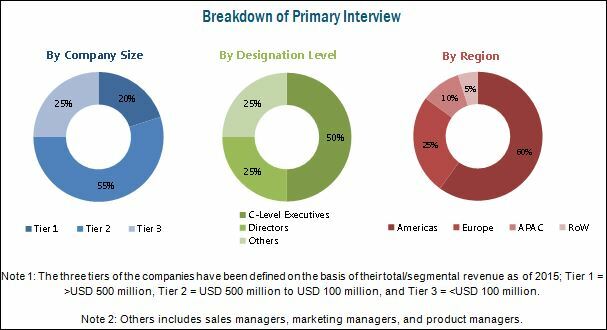 The MEMS market for environmental sensors is expected to grow at the highest CAGR during the forecast period because of the increasing opportunities in areas such as home automation, smartphones, and wearables. The Micro-Electro-Mechanical Systems (MEMS) Market for RF actuator is expected to hold the largest share, and is expected to grow at the highest CAGR during the forecast period. This growth is attributed to the wide usage of RF actuators in smartphones, wearables, and Internet of Things (IoT). RF actuators offer advantages such as reduced size, less power, improved antenna performance and radiated power, and reduced power loss. In terms of the different geographic regions, Asia Pacific (APAC) held the largest share of the MEMS market in 2016 and is expected to grow at the highest CAGR during the forecast period. APAC is a major market for consumer electronics, automotive, and industrial verticals. Moreover, APAC has become a global focal point for large investments and business expansion opportunities. The Americas accounted for the second-largest share of the MEMS market in 2016. This growth is attributed to the presence of some of the major MEMS manufacturing companies and MEMS foundries; the growing industrial and home automation; and the adoption of emerging applications such as augmented reality (AR) and virtual reality (VR) and Internet of Things (IoT). MEMS are widely being used in the automotive and consumer electronics verticals. However, the manufacturing of MEMS is highly complex, and requires advanced and increasingly costly equipment, which has to be continuously modified or maintained to improve yields and product performance and lower the cost of production. Currently, the industry has no standardized process for a majority of MEMS fabrication needs because the fabrication process for a MEMS device is dependent on the application it is intended for. The major players in the MEMS market include STMicroelectronics N.V. (Switzerland), Robert Bosch GmbH (Germany), Analog Devices, Inc. (US), NXP Semiconductors N.V. (Netherlands), Texas Instruments Inc. (US), Panasonic Corp. (Japan), TE Connectivity Corp. (Switzerland), Sensata Technologies Holding N.V. (Netherlands), Denso Corp. (Japan), Broadcom Ltd. (US), Honeywell International Inc. (US), Knowles Corp. (US), and Taiwan Semiconductor Manufacturing Co. Ltd. (Taiwan). Most of the leading companies have followed the organic strategy of product launches to boost the revenue of the company. *Top 25 Companies Analyzed for This Study are - Stmicroelectronics N.V. (Switzerland), Robert Bosch GmbH (Germany), Analog Devices, Inc. (US), NXP Semiconductors N.V. (Netherlands), Texas Instruments Inc. (US), Panasonic Corp. (Japan), Murata Manufacturing, Co., Ltd. (Japan), Invensense, Inc. (US), Infineon Technologies AG (Germany), Asahi Kasei Microdevices Corp. (Japan), Te Connectivity Corp. (Switzerland), Sensata Technologies Holding N.V. (Netherlands), Rohm Co., Ltd. (Japan), Denso Corp. (Japan), Broadcom Ltd. (US), Honeywell International Inc. (US), Knowles Corp. (US), Taiwan Semiconductor Manufacturing Co. Ltd. (Taiwan), Omron Corp. (Japan), Seiko Epson Corp. (Japan), AAC Technologies Holdings Inc. (China), Alps Electric Co., Ltd. (Japan), Amphenol Corp. (US), Utc Aerospace Systems (US), and Goertek Inc. (China). 11.8 Murata Manufacturing Co., Ltd.
11.11 Asahi Kasei Microdevices Corp.
11.12.3 Alps Electric Co., Ltd.
11.12.5 AAC Technologies Holdings, Inc.